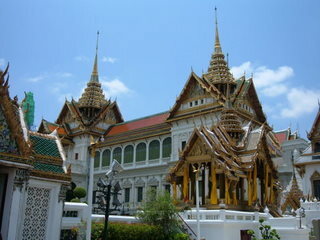 The Grand Palace is located on a site chosen by King Rama I just north of Wat Po, an old 17th century temple. 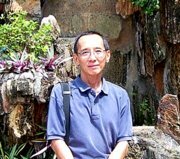 Chosen for strategic reasons, with the Chao Phraya on the west and the Lod Canal on the east, the palace and new capital was far more defensible. Construction of the palace commenced on 6 May 1782 and King Rama I occupied the palace on 13 June. Hundreds of boatloads of rubble were shipped from the ruins of Ayutthaya to build the city walls and public buildings of the old city. Occupying an area of about 220,000 sq m walled within a 500 m square, the Grand Palace grew into a self-contained city that held the seat of government and religion. It became of the pride of the Chakri dynasty and Rattanakosin, the city that emerged from the ashes of Ayutthaya. Please see map to the Grand Palace. It's a pity that visitors are restricted to the outer court, which used to house the government departments. Four main buildings can be viewed from the outer court; two have been in existence since the reign of King Rama I. The Borom Phiman Mansion was built in 1903 during the reign of King Rama V for Crown Prince Vajiravudh. Subsequent kings have also resided in the mansion on various occasions. It presently serves as a royal guesthouse for visiting heads of state and royal guests. The Amarindra Winichai Hall is one of the remaining buildings from the reign of King Rama I. Built in 1784, the T shaped building was a royal audience hall where foreign ambassadors presented their credentials to the king. The most impressive building in the outer court is the Chakri Maha Prasat Hall. Built in 1882 during the reign of King Rama V, in Italian Renaissance architecture with Thai spires and gables, it has a wide façade, a central balcony and double stairways leading upstairs. The Chakri Maha Prasat Hall is currently used for state banquets and the reception of foreign ambassadors. On 13 June 2006, 25 kings and queens, princes and princesses were royal guests at this grand hall for a state banquet to celebrate the 60th anniversary of His Majesty's reign. The Dusit Maha Prasat Throne Hall is the second remaining building from the reign of King Rama I. This dazzling white building in the shape of a cross was built in 1789. Mounted with four-tiered gables on each wing and topped by a spire, it was used for special ceremonies and lying-in state for the royal family. The inner court area unfortunately is out of bounds to visitors. 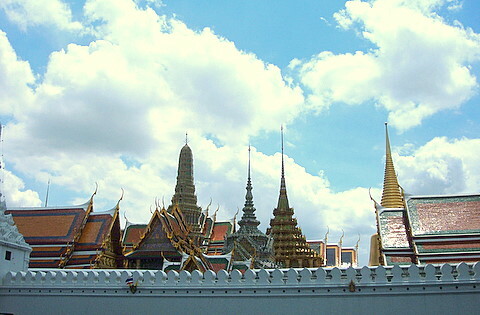 The Grand Palace in Bangkok preserves the legacy of Rattanakosin and the Chakri dynasty. Though Bangkok has grown into a thriving modern metropolis, the cultural heritage of the founding fathers remains intact. The palace complex and the Temple of the Emerald Buddha are to the south of Sanam Luang. A convenient way to get there is by Chao Phraya river boat to N9 Chang Pier. 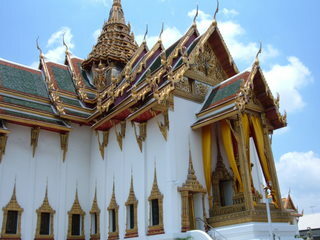 Admission to the palace and Temple of the Emerald Buddha is 500 baht. This includes entry to Dusit Garden, if the visit is made within 7 days.